CTP and the Boston Red Sox scored big time last week at the inaugural CLIO Sports Awards in New York City. 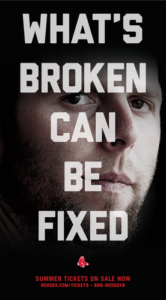 With some powerful insight and great creative, along with an assist from Dustin Pedroia, the 2013 “What’s Broken” campaign brought home some hardware: a Bronze in the print category. The CLIO Awards, which featured hefty competition from international agencies and some of sports’ biggest brands, recognizes superior digital, advertising and creative communications in the sports industry.